A view of Cabin I from the river. The Trout House Cabin I is the original house that we have been renting for 11 years, and we have acquired many wonderful customers in that time. We are so thankful for everyone who has stayed with us and we welcome new customers with open arms. 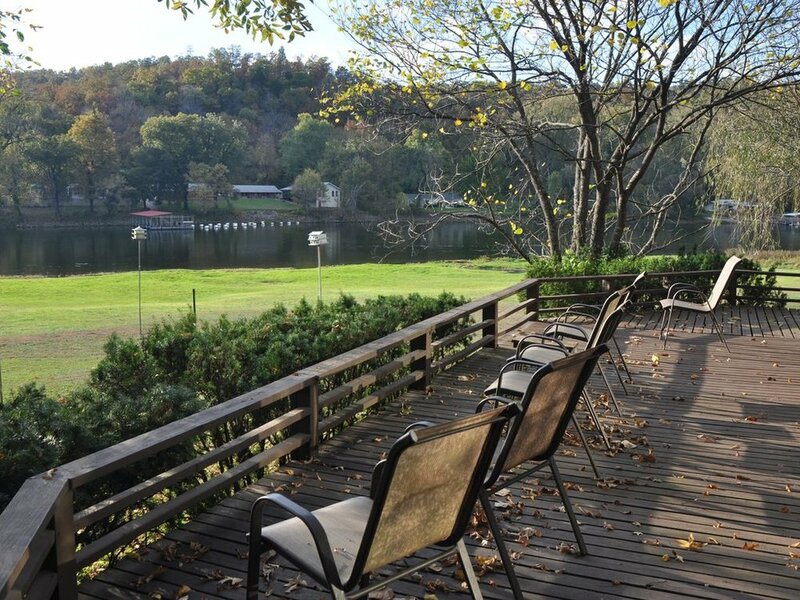 Cabin I is a privately owned home located in a quiet area of the Renowned White River. A relaxing atmosphere where you can catch a trophy trout, take a leisurely walk or ride a bicycle. Relax with the comfortable furnishings in a glass living room with a fantastic view of the White River. Walk out onto a large deck that surrounds the front of the house to watch a trout jump or a bald eagle fly by. The White River is the Trout Capital of the World and is famous for Rainbow, Brown, Cutthroat and Brook Trout. We are within walking distance of Wildcat Shoals one of the best fly fishing areas on the White River. Living Room Features: Relaxing comfortable furnishings in a glass room with a fantastic view of the river, walk out onto the large deck surrounding the front of the house. Kitchen and Dining Room Features: Two tables and a large bar for serving. 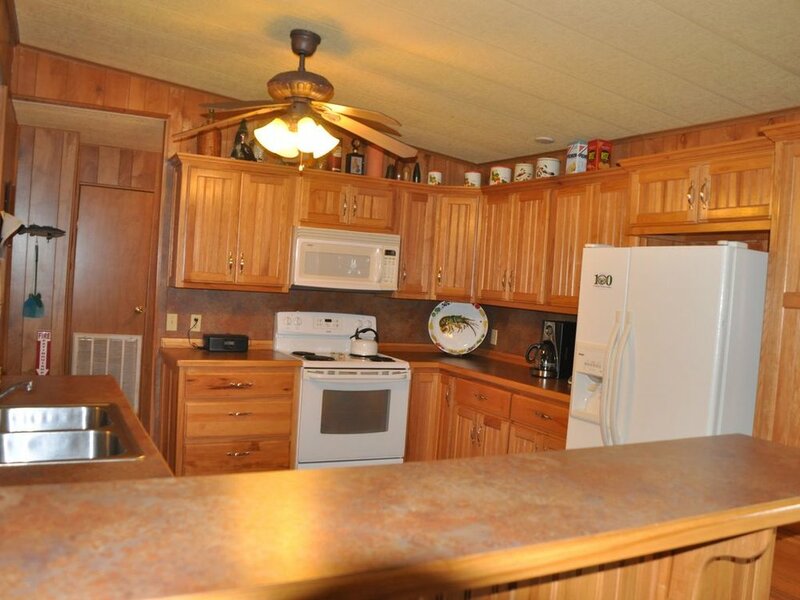 Fully equipped kitchen with all small appliances and cooking utensils. Bedrooms: There is a master bedroom with a king sized bed and private bath. Also, there are two bedrooms that have twin beds. In the living room there is a hide-a-bed, as well. Additional Amenities: Owners Roy and Kathy Sisco want you to be as comfortable as they have been in their vacation home. The cabin is well furnished with WiFi, TV, and games. Yard Amenities: Large front yard on the river Large back yard for cookouts Grills, Smoker, Fish Cookers are available for your use. Plenty of parking, with room for your boat and a basketball goal with a basketball. Only 100 feet to the River and access and launch area. Area Amenities: Cotter, Arkansas is only 6 miles away. Cotter is a quaint little town, with the Cotter Cafe. Plus the Cotter Trout Dock and public access. Anyone that likes to swim needs to see Big Springs Park with a wonderful swimming hole and pavilion. Flippin, Arkansas is only 8 miles away and has the following items that could make you stay even more enjoyable: ATM, Walmart Supercenter, Dollar General, and 2 restaurants. Gassville, Arkansas is only 6 miles away. Gassville has some items that could make your stay even better: Dalleys Fly Shop, Sunfest Grocery, Dollar General, and 3 restaurants.